Tilapia Fish, hardy har har! The Tilapia Fish, hardy and everywhere. The Tilapia Fish. Perhaps the hardiest freshwater fish around. They can live almost anywhere, I have seen them in storm drains and if you have watched the Discovery channel program 'Dirty Jobs', you would know that the Tilapia fish is also used to help clean up waste from water used by other fish. (Apparently such cleaning activity is quite popular). They also seem to breed like rabbits! Again I have witnessed this myself, first noticing them in a storm drain (they are an invasive species in this context because they originate from Africa) at one point in time, and then seeing how the whole stretch soon was filled with large numbers of them. 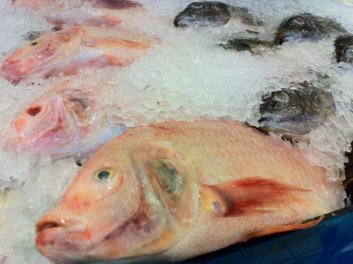 The above does not necessarily make the Tilapia a bad fish. There are some accounts that they are the fifth most important fish species for the aquaculture industry, others say they are third. I have even seen figures that say they are first or at least very near to the top already. Apparently on top of being hardy, able to breed like rabbits and having a high tolerance of water conditions, they are even pretty okay with cramp spaces in ponds that is characteristic of aquaculture. Perhaps more so than other fish. You and I know that any enclosure for any normal fish has its own 'fish limit' if you will. Every fish tank and fish pond will stabilize at a certain population, beyond which, you can start seeing something dying. The Tilapia tends to apparently be quite tolerant of being cramped up. It also pretty much eats anything. If you had read about my pet snakehead fish Joe, you will know what I mean. This makes it ideal to be farmed and actually ideal for poverty stricken communities as well. Excellent protein with not much tending required. Whats better than that? Incidentally, I recall watching a TV Program on a brilliant project out in Calcutta, India whereby the people there have divised an ingenious method of treating their sewage. Yes I know, your face just turned nasty and you had that thought 'You gotta be kidding me?'. Well this aint kidding around at all. The sewage system in Calcutta uses the natural vegetation and soils to help filter out the sewage which are then used to 'fertilize' vegetable cultivation and it culminates with stocking the water with not only the local fish of the area but you got it, Tilapia fish. And yes, these fish are eaten and apparently makes up a large amount of the fish consumed in the area. There are a lot of poor people in those parts so you know every bit counts. In this, the Tilapia fish is pretty damn cool! There are obviously several species of the Tilapia fish. Some tastier than others (again reference my pet Joe) and tastier not just to predator fish but also to humans. 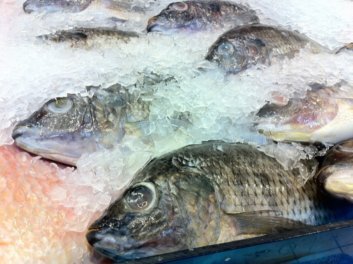 Although both the grey and white varieties are eaten by people (again the species is quite varied, doesnt just get distinguished by these colors), the white Tilapia is known to taste better. At the same time, the taste is quite neutral and it doesnt have any fishy or muddy taste that some farmed fish tend to develop. Above and beyond its increasing importance as a food source for you and me, its also an important fish food. Its quite an ideal and tasty alternative as live food for your freshwater predatory fish. An important thing to know about the Tilapia is that its a member of the Cichlid family. 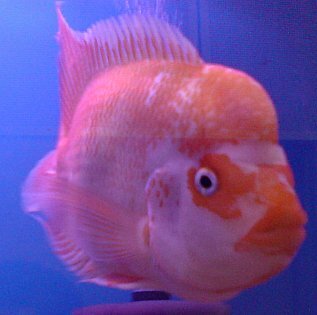 Unlike the varieties of the great lakes of Africa, which need specific PH levels for the water they swim in, the variety of cichlid that I am talking about tends to thrive in neutral PH water. So there you go, its an important food fish (and they are actually farmed like any other fish using accepted aquaculture standards -- just to counter the interesting stuff I wrote above) and its an important feed fish. This fish is really easy to care for in the fish tank. In fact I would say most people dont really keep them in fish tanks. They are generally used as food for other fish OR food for humans. Its quite a favorite fish for aquaculture since its fairly hardy. I have seen this fish being kept outside of homes in ponds, precisely for use as dinner just like chickens are kept around the house. Traditionally grey or white. There are some varieties that have some coloring. The 'Flowerhorn' fish which basically is a mixed Tilapia (created by man) can get quite elaborate and in this sense was a favorite among some fish enthusiasts for a while. Elaborate both in color and in the shape of its head. 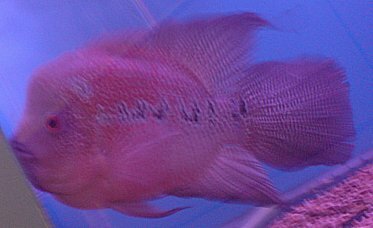 5/10 - As I said, this fish is not really one that is kept in fish tanks (except the Flowerhorn variety I mentioned) It lives pretty easy though, doesnt get affected too much by disease and stuff. Its a big aquaculture fish (for human consumption) and also as food for predatory fish.